We had read a couple of reports that the Briksdals glacier was worth a visit, not sure what we expected but finding 12 coach tours at the base wasn’t one of them. 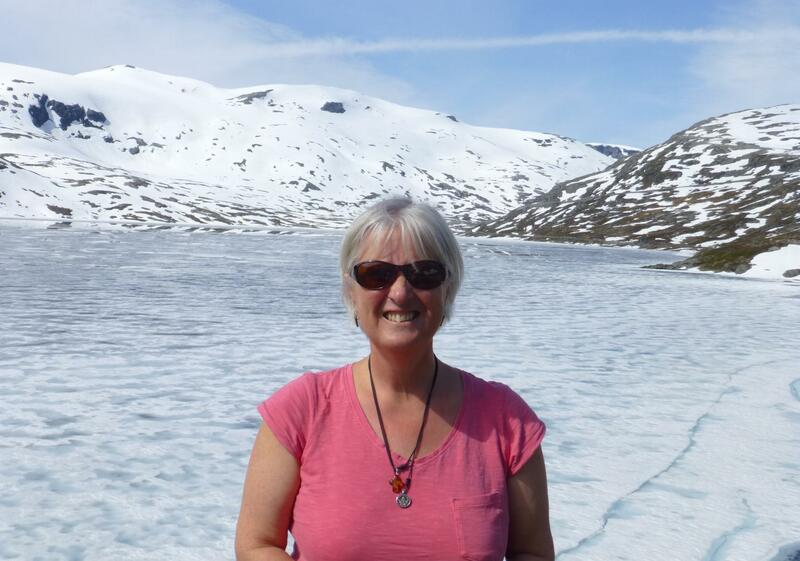 Would love to have said we hiked up to the glacier, it was steepish but very like doing the Snowdon Conga – follow the kagool in front and you couldn’t go wrong. For those not wanting an hour uphill walk there was an option of using a “troll cart” being a 4×4 golf buggy, popular with many of the Asian visitors until they found out it dropped them a good 15 minutes walk to the glacier :). 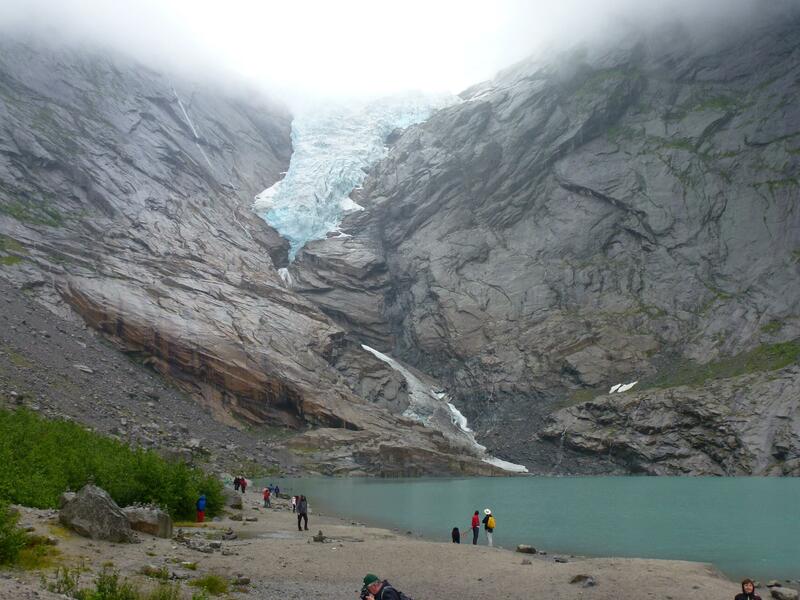 Briksdalsbreen ends in a small glacial lake 346 metres (1,135 ft) above sea level. For us the most astounding thing was the marker posts showing where the glacier has grown and receded over the last few hundred years. Even in the 20 th century it receded by over 2500 ft in the first half of the century revealing the lake and then grew by 1600 ft in the second half recovering the lake again. It looks like the ice is going to break off any second, we sat for half an hour with our butties and a flask waiting for an ice slip but nothing doing. Following our trek we treated ourselves to coffee and cake in the cafe at the car-park. Fully expecting to shell out enough to buy a new kidney we were pretty happy at less than £5 for cake and coffee for two. 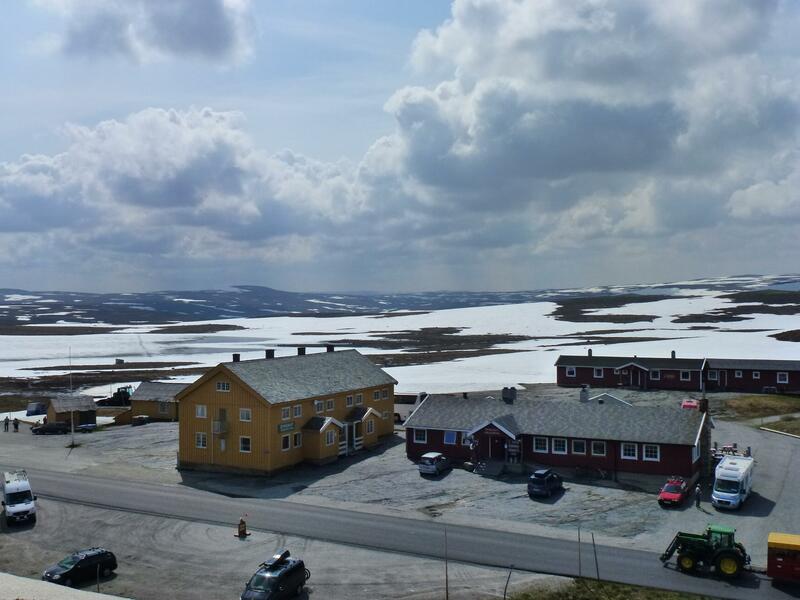 Norway is without doubt a bit contrary on prices, its either eye wateringly expensive or cheaper than your average trip out to the seaside in the UK. 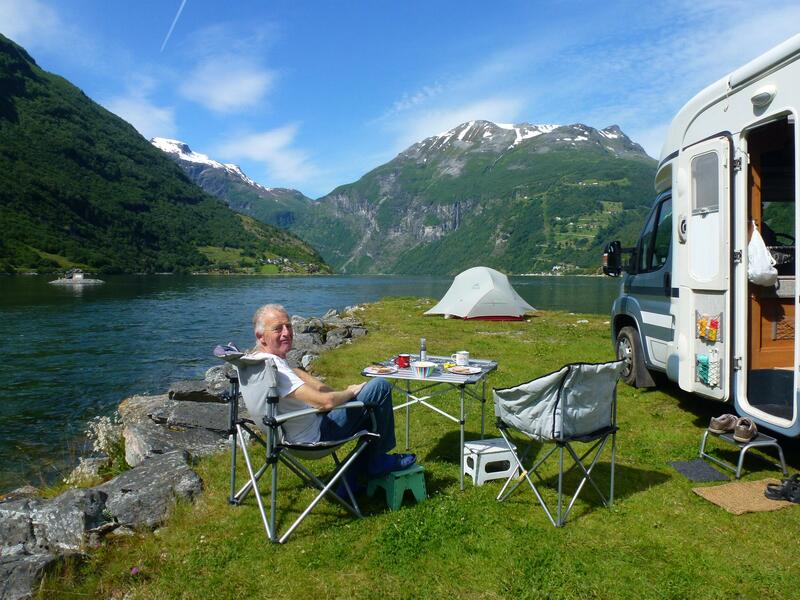 We have found campsites at £35, then again we have found just as many charging £15 – usually on the side of a fjord with everything thrown in on the cost. 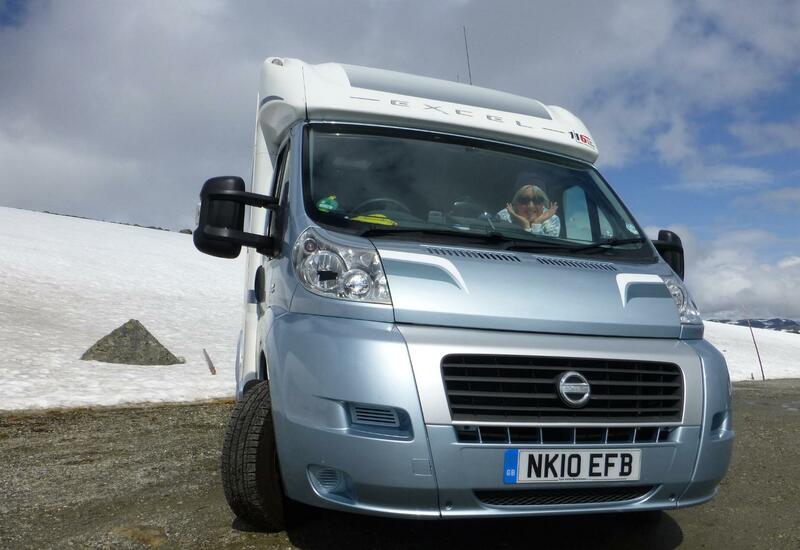 Service Points for motorhomes wild camping (water fill / empty and loo empty) are all over the place – usually free. We found one the the other day that was the 5-Star of service points, so much so it even had a guest book so you could comment on how you found the facilities to empty your loo!! it was amazing, Iain was in there 15 minutes he was so impressed. With wall to wall sunshine forecast for Friday we chose that as our day to arrive at our latest Unesco site, Geirangerfjord. Two hours drive on wonderful roads, scary tunnels and views that delay progress as they beg for photo stops every mile. We have never come across so many switch-back roads before, up and down each mountain on route, the smell of smoking brake pads (usually ours) pervades the air at the bottom of every mountain. Again there were surprising amounts of snow and ice covered lakes as we crossed the mountains, whilst the roads are completely clear we passed drifts on the sides well over 7 and 8 ft deep. The tunnels are freaky, too empty, too eerie, often no lighting and rough sides. Midway through many of the longer tunnels are sets of gates with traffic lights which go red if the gates are closing (if floods are due!) – so 3.5 km in if they close am intrigued as to what your average car and caravan does to turn around as there isn’t usually a turning point. 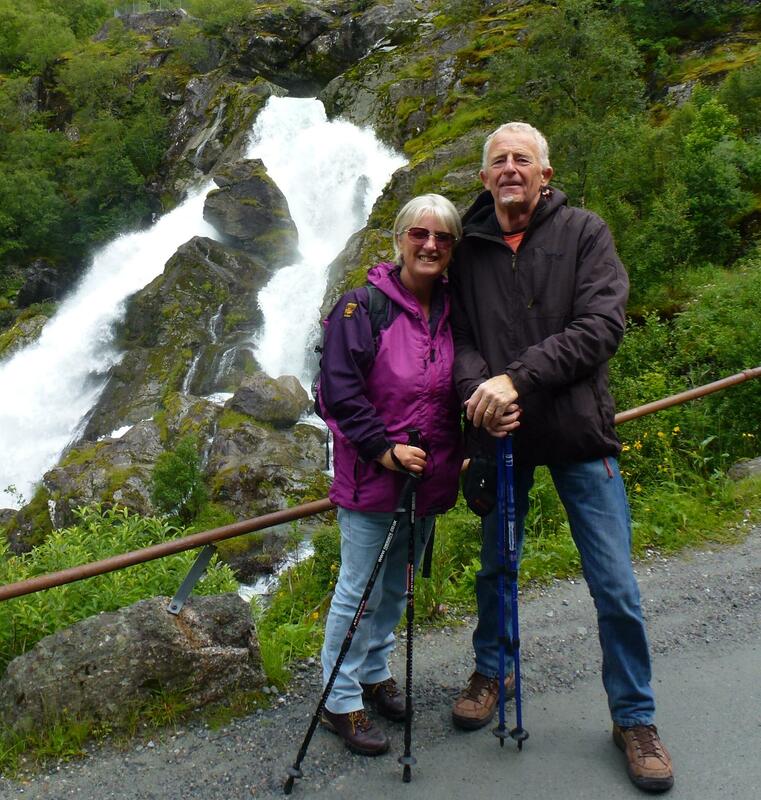 The route over to Geiranger took us along Oppstrynsvatnet, a fjord that stretches forever with towering cliffs and the greenest water we have seen. 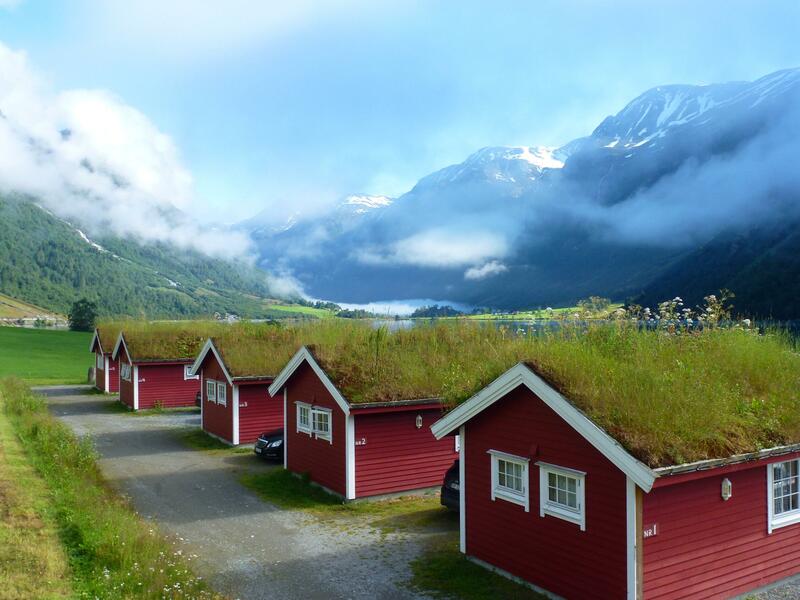 As with everywhere we go in Norway most houses, sheds and holidays huts had grass roofs, it’s the norm rather than the exception to see them even on modern family houses. Many have flowers growing and we have seen loads with small shrubs and trees shooting out from the roof tops. It is on the project list for when we get home – maybe the shed first and then see if it catches on with the rest of the street :). 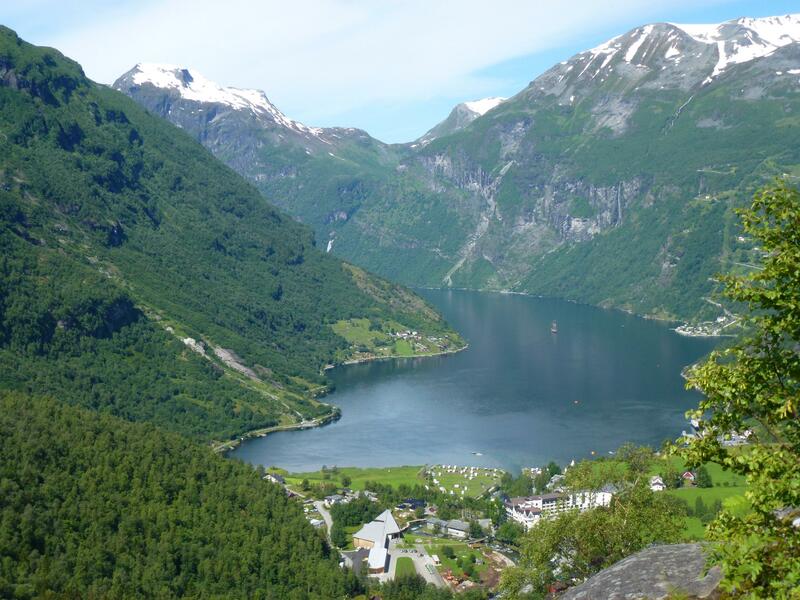 Geirangerfjord is listed as one of the most visited and photographed places in Norway, it is so easy to see why. Sheer cliffs each side with the small village at the head of the S shaped end of the fjord, visiting cruise ships come and go throughout the day and evening. We were told it has rained every day for the last three weeks, the luck of the trolls was with us then as we came down the mountains to clear blue skies, snow capped cliffs and pure green fjords. The village consists of a good number of souvenir shops, a couple of restaurants and a large hotel. It caters very much to the cruise ships and to the out-door adventure types – trips on offer ranged from Rib rides, a Renault Twingo safari (no really) and Road Skiing. The latter seems popular here, we pass someone skiing along tarmac roads at least a few times a day, and have even seen a few going up the mountains – we have so far resisted the urge to hurtle along on 4 ft long roller skates and pretty sure we are not going to be tempted any-time soon. Today its been less sunny, a fair bit of rain on and off. We wandered around the village and the tourist shops checking out the millions of wizened trolls for sale and mingling with a few thousand Brits off the Arcadia cruise ship that is docked in the bay here, it felt a bit like being in the Lake District on a wet Bank Holiday. Arcadia left at tea-time to the sound of guns being fired from the quay-side, returning the salute with several loud blasts from her horn. 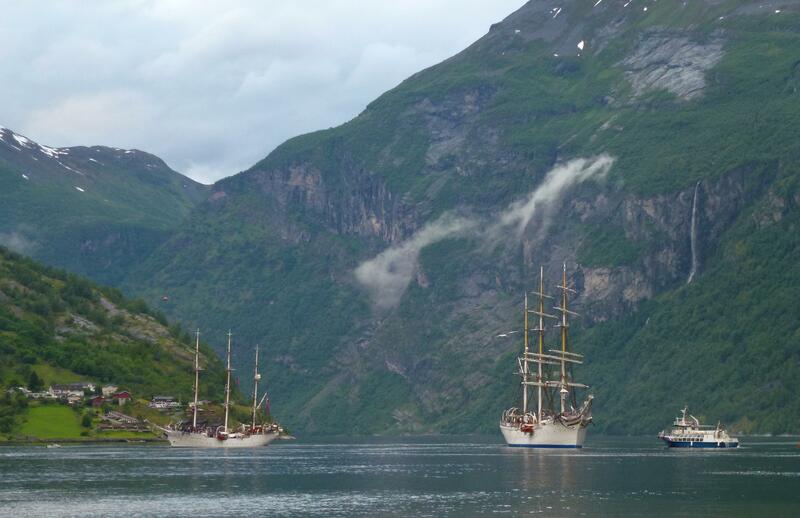 The Norwegian Tall Ships race has been on this weekend, lucky for us three of the ships arrived this evening, then an further four have appeared to yet more gun-fire and all anchored just outside our windows :), whatever else may or may not be expensive here the views are priceless! 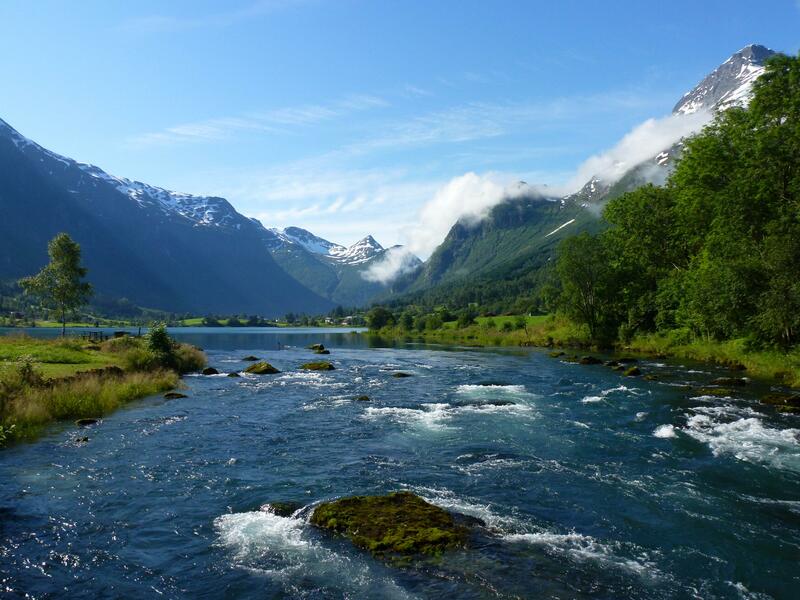 We fully expected Norway to impress, it has already gone beyond impressing and is fast becoming jaw dropping. The weather has been up and down, sometimes that just adds even more, seeing somewhere in a mist and cloud, then the sun pokes through and the view changes from stunning to breathe taking. 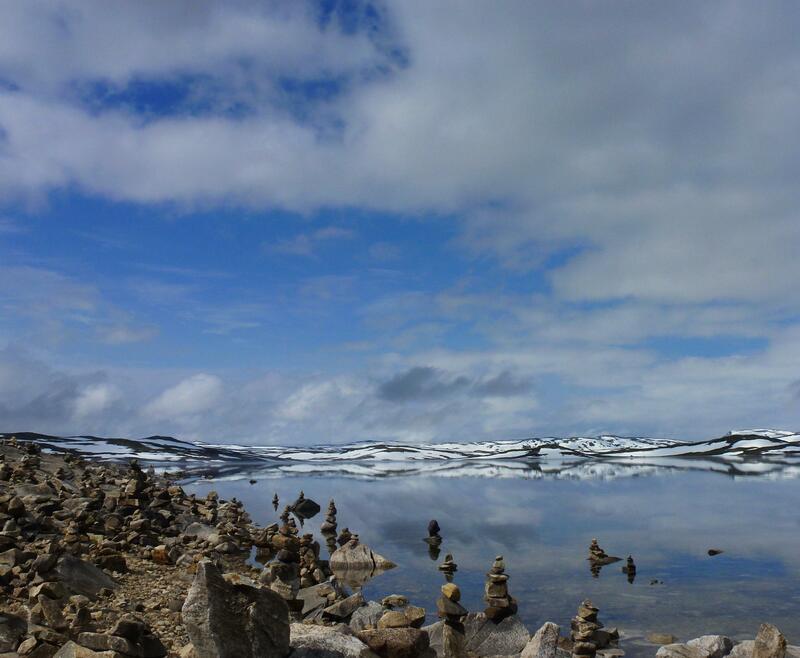 Following route RV7 – across the Hardangervidda we pulled in for morning coffee break at Lake Skiftessjøen, where the edge of the lake is lined with hundreds of small cairns and has views over the glacier. Along with several other moho we stuck the kettle on, poured the coffee and spent an hour taking photos as the view changed every few minutes as the sun broke through more of the clouds. Once we left the lake the day settled into a pattern that has continued all week, drive for 10 minutes, stop get out and take photos, drive for 10 minutes, repeat. As we headed over the pass the snow thickened, and at every parking space small groups of children were running around in the snow. 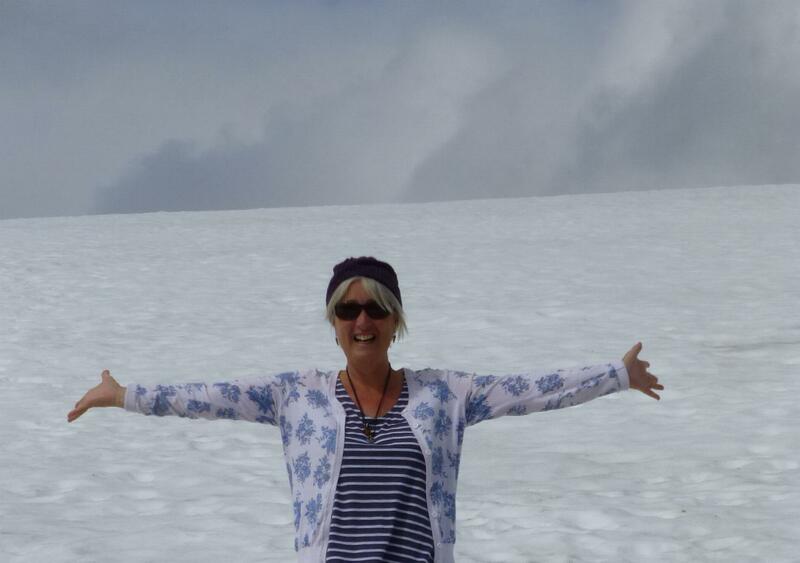 Snow in July is too wonderful to ignore, as soon as we found a parking spot to ourselves we were out there – and yes we avoided the yellow bits! In some places a few inches deep, in others literally several feet deep – if this is summer cannot imagine it in winter. 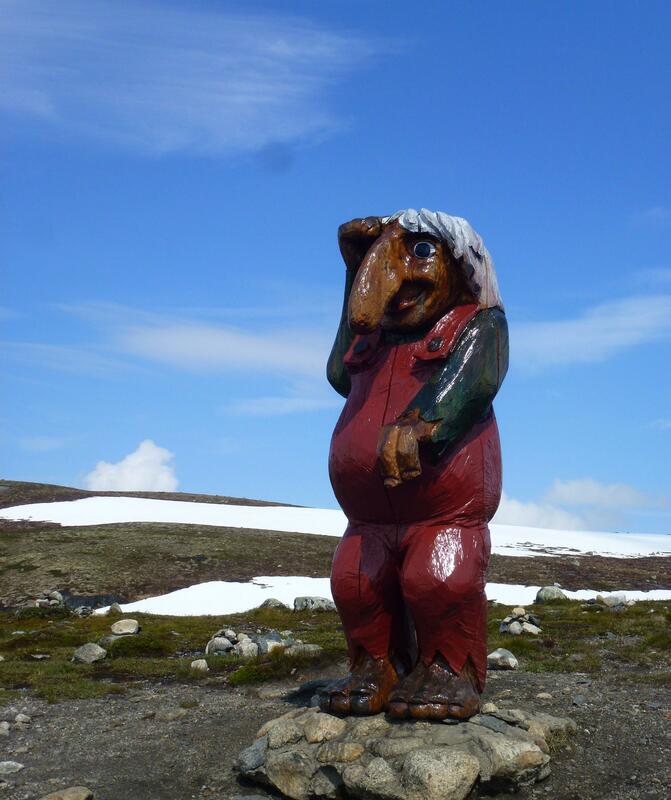 Just before Eidfjord, there was a small cafe, a car-park and over-looking the area a 7ft troll stood high above on the next hill. Most of the snow had gone on the path up to the troll, making it somewhat of a tricky, slippy and muddy path but our first real troll so we needed to brave the elements. Since then there have been more waterfalls than we could count, several gigantic trolls, too many tunnels to mention and yet we still stopped for photos every couple of miles. Another day another bridge – the Hardanger Bridge opened in 2013 – another of the longest this time in Norway. Overshadowed by another first for us – as we left the bridge we entered a 7 km tunnel and after 500 metres there was a roundabout in the tunnel! 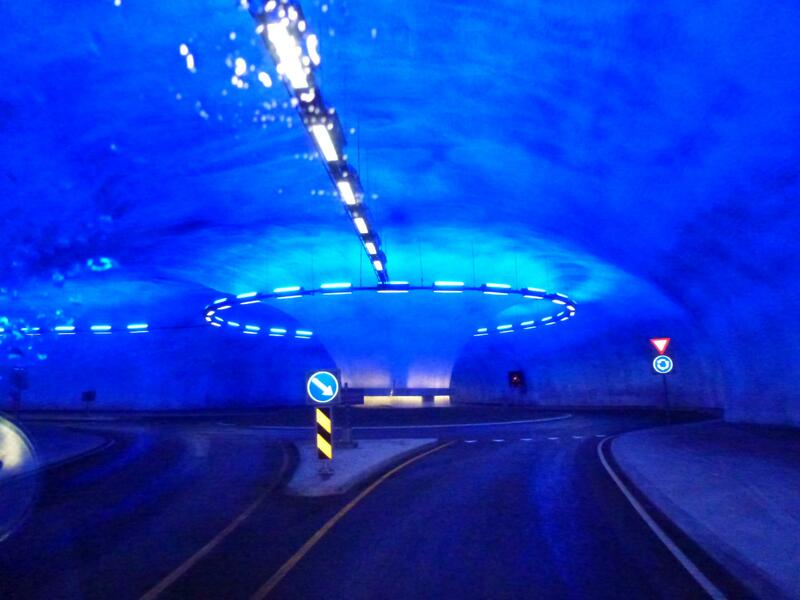 We had heard of tunnel roundabouts but experiencing one is one of the strangest driving experiences, it looked like the Starship Enterprise was beaming down through the rocks. We took the wrong exit off the roundabout and had to come back to it again, our most worthwhile wrong turn to date. 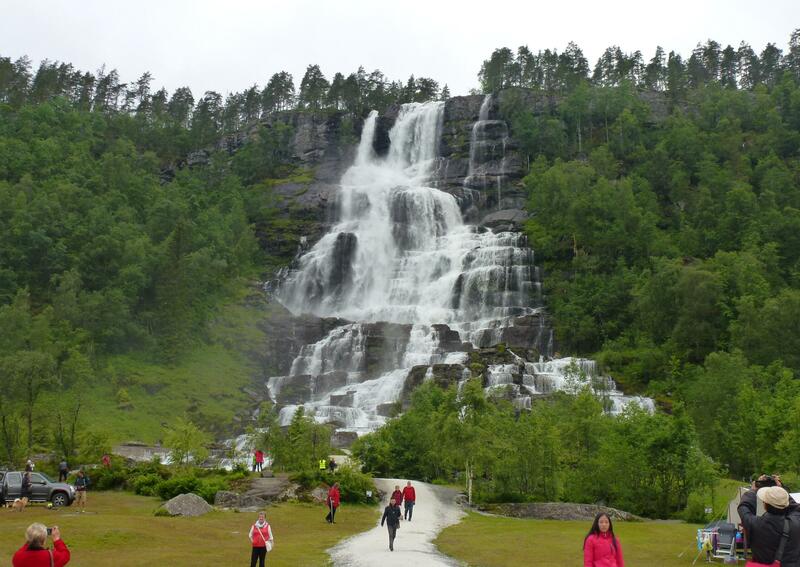 Waterfalls have ranged from the spectacular to the unbelievable, Voss was incredibly busy with bus loads of tourists, others as we climbed up and down the mountains were just as stunning but not a soul around. Everywhere we go the hardy Norwegians are out in force, we see them at every picnic stop be it at a tourist attraction or at the side of the main road. Rain or shine, the tablecloth comes out followed by picnic hampers that Fortnum and Mason would be proud of. Guess that they have long winters so make the most of the long summer days, sun set this week has been at 1114 pm, the days just never end its fabulous :). 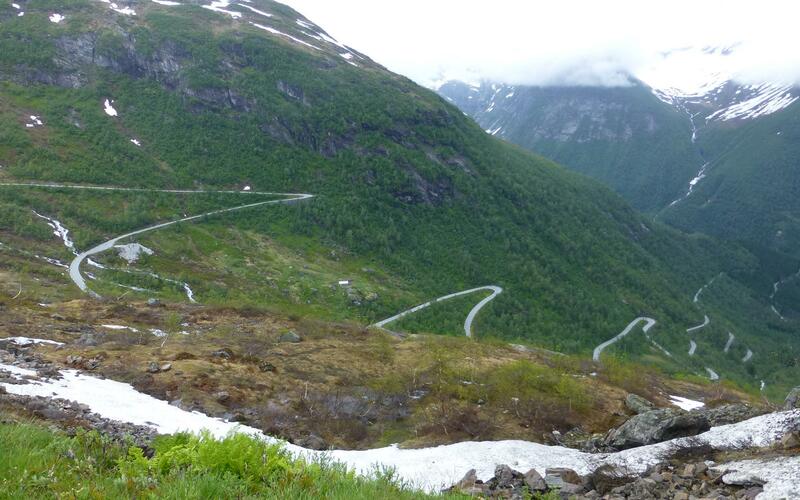 The roads marked as tourist routes are not subject to tolls so we followed the E13 from Voss to Vangsnes, . The switch back roads up some of the passes were views I could have done without. At the top of one of the passes there was a platform being built that hung out over the valley to give a view back down over the roads, I left Iain to get that photo. Some of the roads are not very wide, despite the fact there are buses and wagons, along with a few hundred motorhomes, trying to squeeze through. Too often for my liking we were breathing in to get through a gap with a sheer drop on my side of the road. Sognefjord was our first ferry crossing, a 15 minute hop over for just under £12, not quite a cruise but as close as it gets as we were first van on so had the view over the open deck. 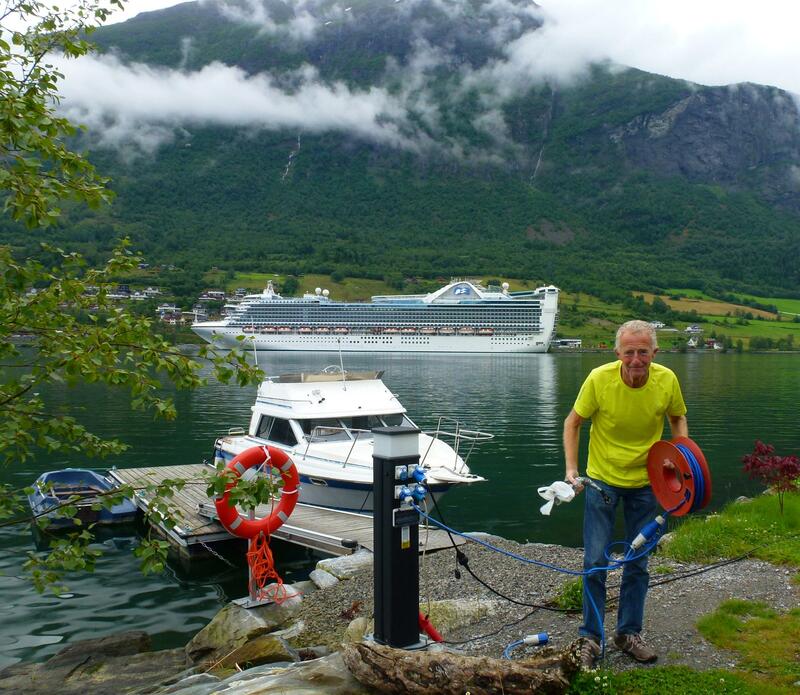 Whilst we are sure Sognefjord looks perfect in bright sunshine, it has to be said it is far from shabby in any weather. 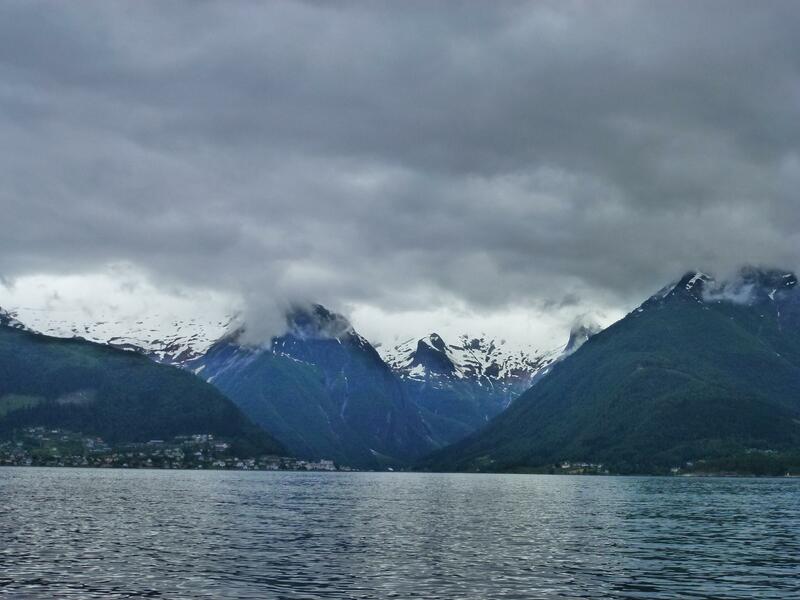 The third largest fjord in the world, 127 miles long and at it’s deepest over 4100 ft – which is deeper than Ben Nevis is high. Dotted along the edges are numerous small fishing villages, some of which date back to Viking times. The pace of life seems slow, no-one rushes, cars wait to over-take, people have time for a smile and a word – the Norwegians have got the pace of life just right for us. 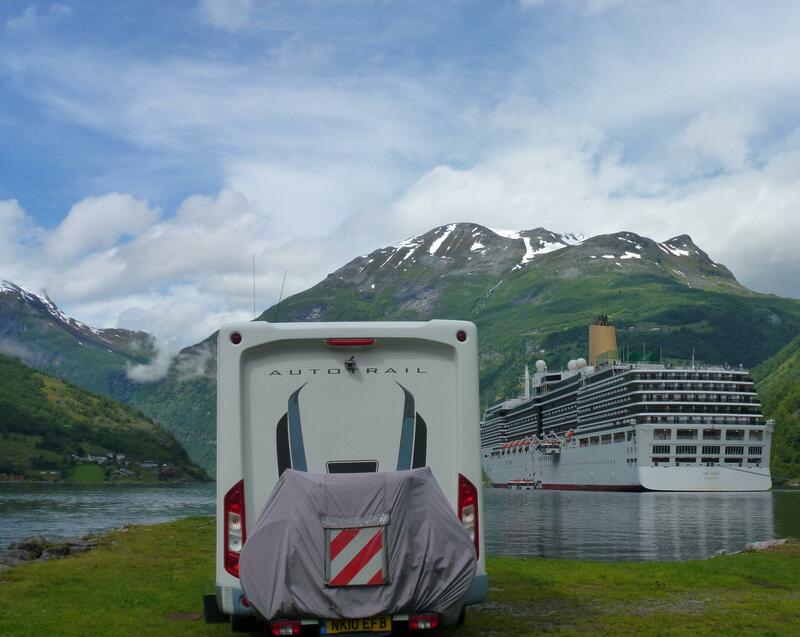 We are quietly parked up on Nordfjord at Olden for the evening, well it would be quiet if we weren’t within spitting distance of both the Caribbean Princess and Balmoral cruise ships, moored less than a couple of hundred metres in front of us with generators working over-time. At the quay side it’s a hive of activity with a few thousand people racing around the dozen shops trying to buy as many souvenirs as possible, taking trips on the toy town train or a double decker bus trip up the glacier (rather them than me!) and rib rides on the fjord. Strangely mesmerising just sitting looking at cruise boats that are going nowhere.